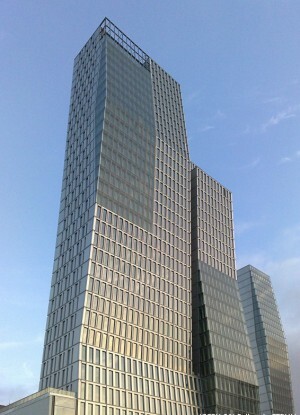 Positioned outside the limits of the cluster of high-rises in the neighboring banking district, the PalaisQuartier forms the architectural highpoint of a new district in downtown Frankfurt—with shapes that catch the eye even from a great distance, its expressive shape creates an exciting counterpart. 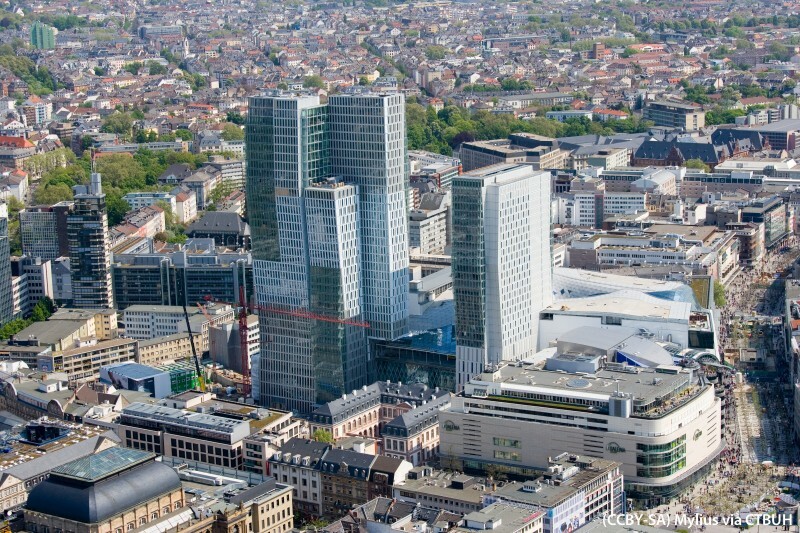 Together with the Thurn und Taxis Palais Townhouse (recently rebuilt to preserve its original façade), and the “MyZeil” shopping mall, the PalaisQuartier rounds out a new district which has a decidedly urban flair. The urban planning concept from the outset envisaged the construction of an urban quarter on the former Post Office site that linked various facilities such as accommodation, hotels, offices, restaurants, event rooms and retail outlets with each other. 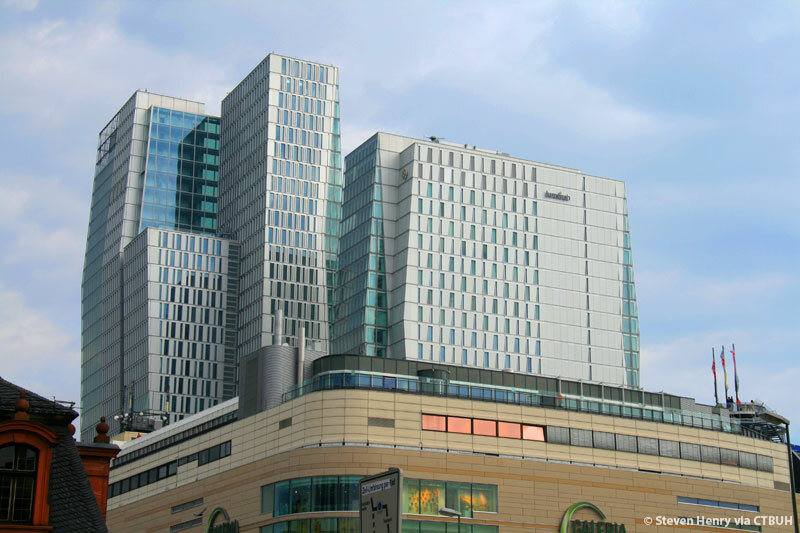 The new combination of reconstructed space, inner-city shopping mall, office high-rise tower and hotel creates a lively urban place in the center of Frankfurt. 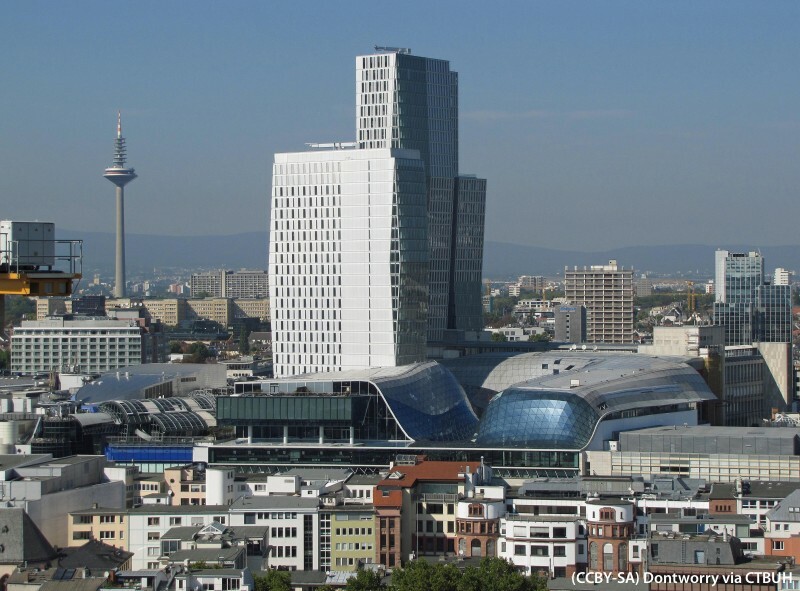 The Thurn und Taxis Plaza forms the publicly accessible center of the new quarter, enriching the inner city. Two materials, namely aluminum and glass, define the appearance of the face of the building, which is designed as segmented curtain façades. 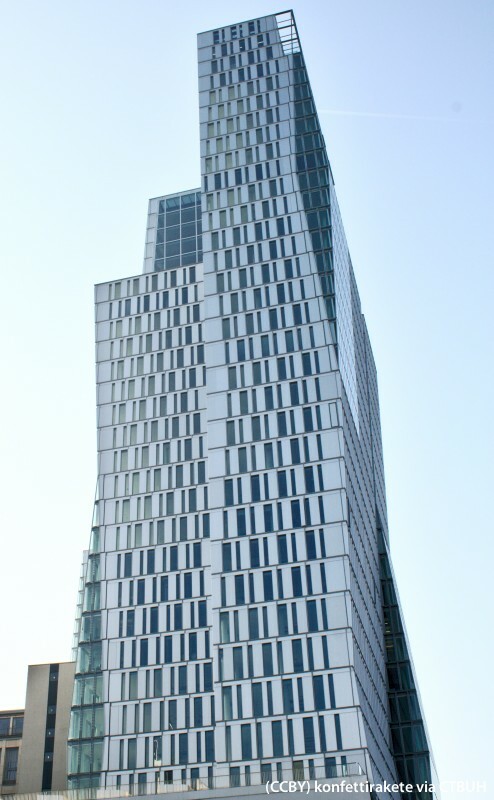 The eye-catching characteristic of the tower is, when seen from the side, the diamond-shaped fully glazed surfaces. They are integrated into the façade like crystalline bodies. In order to emphasize the crystalline character of the glass, diamonds are implemented as dual façades using highly transparent, untreated panes of glass as the outer layer, with solar protection integrated into the intervening space in the façade, and insulation-grade glass windows constituting the inner, thermal skin. If desired, the windows in the office high-rise can be opened to provide natural ventilation. The transparency of the high-rise façades with their non-reflecting windows makes it possible to look in and out, enlivening the high-rise and opening it up visually to its surroundings. The tower’s slightly tilted façades are structured by the three striking fold lines and their height, which is defined by the design and derived from the overall shape. Inspired by Constantin Brancusi’s gleaming column-like artworks, the sculptural qualities of the office tower with its neighboring hotel tower serve as unmistakable points of orientation in the city’s fabric. The tapering/expansion that results from the tilting creates office footprints with different depths in line with the building’s underlying geometry. The usable depth of the office areas, which are 3.05 m (10ft) high from floor-to-ceiling, is about 5.9m (19ft) in the tapered sections and up to 9.6m (31.5ft) in the zones that jut out furthest. This variance encourages a great range of different office layouts, from executive offices via combined offices with a central area for communicative shared usage, through to open plan offices. The energy concept envisages that about 50% of the heating/cooling energy requirement is covered by sustainable systems. About 20% of the figure is obtained geothermally through a combined heat-pump and cooling system. The highly efficient central heat recovery plant relies on radiant heat from the shopping mall and the underground car park. It provides about 30% of the total heating energy requirement. The rented areas are cooled/heated by means of a heating control system for the respective building section integrated into the concrete ceilings. For this reason, there is no need for suspended ceilings in the sections containing office workstations. Ambient temperature, lighting and solar protection blinds are all centrally controlled by sensors, whereby they can be individually set at any time.